This site was created to have my own space where I can share knowledge about Microsoft technologies especially CRM Dynamics and Power BI, I have already worked for almost 11 years with Dynamics CRM and 9 years as an IT solutions consultant. 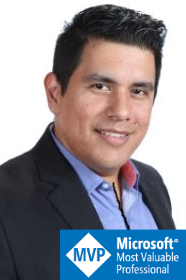 Microsoft MVP in Dynamics 365, VP of Event Programming in Mexico for the Community365. knowledge or listening to others as they are experts in other areas. cuento con ya casi 11 años trabajando con Dynamics CRM y 9 años como consultor en soluciones de TI. ya sea compartiendo conocimiento o escuchando a otros como son expertos en otras áreas.